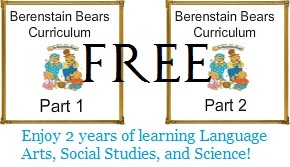 Enchanted Homeschooling Mom is offering a Free Printable Year of Learning with The Berenstain Bears Curriculum Part 1 and Part 2 to confirmed email subscribers. This free curriculum covers two years of a variety of subjects for grades PreK-3 using books that can typically be found in your local library. Click here for more free educational resources!